When your folks announce plans for a family summer vacation, mixed emotions are bound to arise. There’s excitement for a change of scenery and bonding with seldom-seen siblings — plus, there's a lot to be said for a trip that you most likely don’t have to plan or fully finance on your own. However, for every unique travel tradition or activity that you look forward to with your clan, there are likely a few drawbacks. Family dynamics are tricky, especially as you grow up and embark on your own life. But it’s important to appreciate your family’s quirks and treat your time together (and away from work!) as an opportunity to relax and renew, rather than seeing it as a source of stress. Below, we’ve mapped out 10 of the most annoying things about family vacations, along with tips on how to cope with them. Who knows, you just might end up being the family member who saves the trip for everyone. By now you’ve probably moved away from the nest, and are enjoying a life apart from your family. Perhaps without even realizing it, you’ve developed new living habits and aesthetic preferences for your surroundings. Nothing threatens to upset that balance quite like a family getaway, with everyone bunking in close proximity. Maybe you're sharing a room with a sibling or two, and your parents are right down the hall. Within minutes of your arrival, your sister is rummaging through your suitcase asking to borrow that new dress you haven’t even worn yet, and your brother is blasting music so loud you feel like your head might explode. This is when a generous, go-with-the-flow attitude is required. 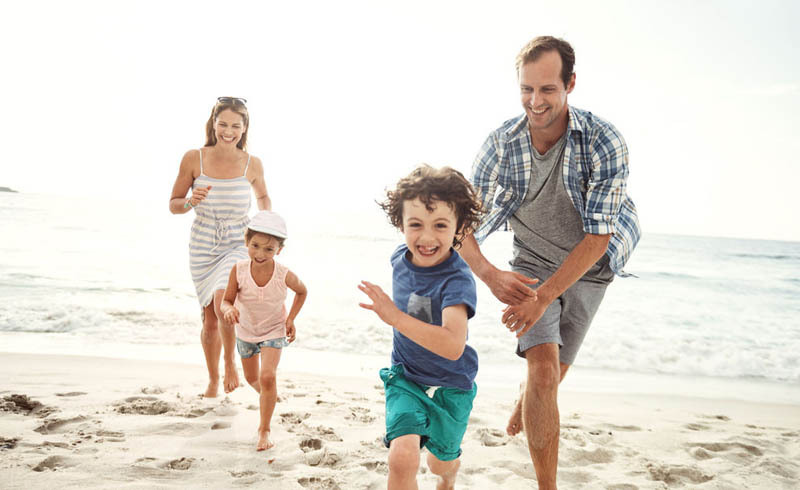 Gail Gross, PhD, a behavioral psychologist, says flexibility and a positive attitude can go a long way toward ensuring your family has an enjoyable vacation together. Still, even if you're able to embrace this laissez-faire attitude (which is easier said than done), it’s also important to set limitations. Before any spatial issues arise, let your family know up front what really bothers you, and be open to their needs, too. It’s natural to want your own space, but pick your battles, and remember: This is a temporary arrangement. We’ve all experienced those moments when our parents seem to forget that we are adults capable of making decisions without their supervision. Though their concern is often motivated by the best intentions, it can be very frustrating to feel like a child again. Whether they question you about something small (you're wearing that top to dinner?!) or big (why aren’t you married yet? ), it’s maddening to feel micromanaged. And on top of unwarranted conversations about your life choices, you may also be subject to family rules on vacation. The best thing you can do is brush off the little things and focus on discussing the larger issues, or calmly explain that you're enjoying your time together, and that any conversations about your life choices should be put on hold until after the trip. Throwing a tantrum or letting off-the-cuff remarks get to you will only perpetuate the cycle of feeling (and being treated) like a child. Matters will escalate quickly if there are multiple hangry people trying to agree on what, when, and where to eat. Julia Simens, a family travel planner with a masters in clinical psychology, suggests setting up a system for everyone to pitch in meal ideas prior to the trip. To accommodate different tastes and schedules, she encourages families to eat some meals separately. For example, if your parents want to eat on the earlier side, join them for a drink then grab a casual bite later in the evening. If you’re staying somewhere with a kitchen, split up into groups and switch off with cooking and cleaning. Gathering around a kitchen and preparing a meal can be great for family bonding, and it’s often more cost-effective than dining out for every meal. You can’t get closer than family, and with that closeness may come extreme bluntness. After spending days on end together, harsh words and quick tempers are all but inevitable. Author and travel connoisseur Val Grubb explains, "We all have hot buttons, but because of shared history, family members are the ones who best know how to push them — both intentionally and unintentionally. It’s critical to adapt a philosophy of 'letting go' when you’re on vacation with an aging parent or other family members." The last thing anyone wants is for a disagreement to escalate to the point that it taints the overall experience and memory of the trip. Behavioral health expert and family therapist Wendy Young advises that families come up with a code word, so that when tempers flare, saying that word automatically halts the conversation. At a later time when everyone has calmed down, you can decide if the issue is worth revisiting and resolving, or if it’s best to just let it go. It’s best to accept up front that a family trip is not the type of vacation where you can escape others and find peaceful solitude. Most likely your family members are very comfortable invading your personal space and are expecting a lot of bonding time. Before joining your family, mentally prepare yourself to be without privacy for the duration of the trip. You may be sharing bedrooms, bathrooms, kitchen space, TV channels, Wi-Fi, and more, and it’s better to accept (if not embrace) this lack of privacy in advance. Grubb notes that being in contact 24/7 while on vacation can be taxing, even on the best of relationships. She suggests setting aside an hour each morning before everyone wakes up to take a walk by yourself or visit a local coffee shop for an early morning espresso. Going to the gym is also a good solo activity that can relieve any stress built up from being in close proximity. If your significant other is traveling with your family for the first time, things are about to get up close and personal. Any family history or secrets, or general peculiarities that you would prefer not to share with your partner may come out into the open. Be prepared for members of your family to ask awkward questions about your relationship, and maybe even implement some rules during the trip (separate bedrooms, no date nights, etc.). Set the proper expectations by talking to your folks and your S.O. in advance about any house rules, and avoid embarrassing conversations by giving both your partner and your family plenty of information about each other prior to the vacation. If you suspect your mom will ask invasive questions, take the initiative to brief her beforehand, and ask her to resist the urge to pry to the greatest extent possible. Also, let your significant other know about any unique dynamics, like your dad’s sleepwalking habit, or your family tradition of playing very competitive musical charades. The fewer surprises, the less opportunity there will be for awkward situations. Finding a destination that appeals to everyone is the first hurdle (especially for a multigenerational vacation) — then comes the task of planning activities that everyone will enjoy. Grubb advises that everyone on the trip be consulted and considered when it comes to activities, regardless of his or her age or personality. "If someone says, 'I don’t care,' don’t accept that answer. Everyone cares." 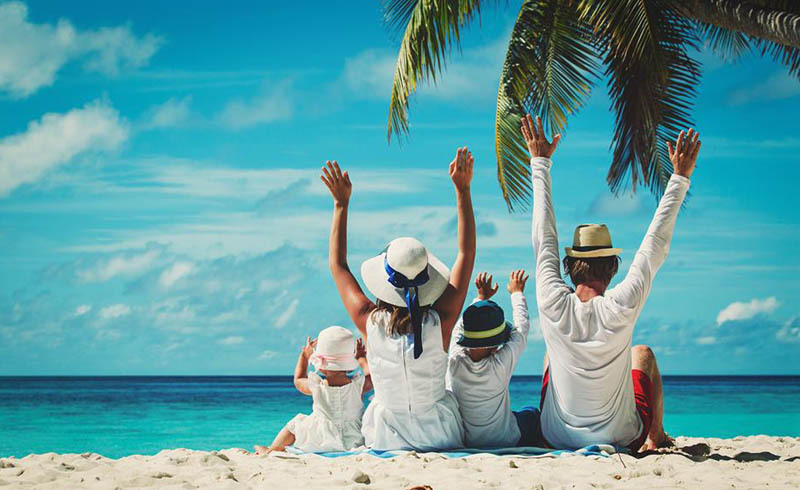 Of course, you may be able to split up here and there to do your own thing, but for the most part, family vacations are about making memories together. Plan ahead so that each family member picks at least one activity that he or she is excited about, and be accommodating if the agenda includes something that doesn’t appeal to you. At the end of the day, flexibility and willingness to put on a good face will make your trip much more enjoyable, regardless of what you are doing. If you truly want to have a carefree and enjoyable family trip, do not use this time to express your feelings about family members’ alternative lifestyles or questionable choices. As soon as judgments are made, defenses go up, and willingness to bond goes out the window. If and when you start to feel irritated by your family members' choices (maybe your brother refuses to shower, or your mom won’t participate in any outdoor activities), Grubb advises that you first remind yourself that you’re on vacation. The goal — for both you and your family — is to relax and get away from your regular routines. Second, try to shift the focus from the negative to the positive, and utilize your family’s inside jokes to lighten the mood and keep everyone focused on having a good time. Sure, it’s vacation, but let’s not get carried away; you aren’t on junior year spring break. You know your family better than anyone, so put yourself in their shoes when determining what is appropriate. Regardless of your family’s policies, it’s probably best to set some basic guidelines for yourself. This may not be the best time to show up at 4 a.m. with a houseguest, for example. Whatever the parameters are for you and your family, adhering to them will help ensure that everyone feels comfortable and has a good time. There's a lot of pressure that comes with planning the perfect family vacation. Everyone hopes that it goes smoothly and turns out to be relaxing. For that reason, it’s important to consider your expectations and be flexible when things don’t go as planned. Certified coach and parenting expert Elaine Taylor-Klaus encourages families to have a meeting to set clear expectations and talk openly about any decisions that need to be made in advance. She recommends establishing fun as the main objective of your trip, and asking each family member for input on what an enjoyable time would entail for him or her. Balance everyone's preferences, prepare, and set realistic expectations. After that, roll with the punches and HAVE FUN.